In late 2007 I started having chronic lower back pain from degenerative disc disease. I tried treating my pain with physical therapy, lots of core work, massage, and nutritional supplements, and by some point in 2008 or 2009, my back was feeling better. In early 2013, when I was 43, I began to suffer from a new symptom: very occasional numbness of my hamstrings and glutes. It turned out that this numbness was related to my lower back pain from a few years earlier. My discs between L3 and S1 had continued to deteriorate, and X-rays revealed that two of those three discs were squashed to the point where the adjacent vertebrae were barely separated. Furthermore, between 2008 and 2013, the instability in my lower spine had caused a spondylolisthesis to develop, and my lower lumbar vertebrae were now improperly aligned; certain activities and positions caused my spinal cord to be pinched, and this produced my numbness. Over the next few years, this symptom became much worse. I suffered from it more frequently and for longer periods, and it affected a larger portion of my legs and feet. I limited my physical activities—for example, I gave up running—and tried more physical therapy, core work, massage, and nutritional supplements. I also tried Pilates and chiropractic and epidural injections of steroids. No matter what I did, my symptoms continued to worsen. I consulted with surgeons in the Reno-Tahoe area, where I live. 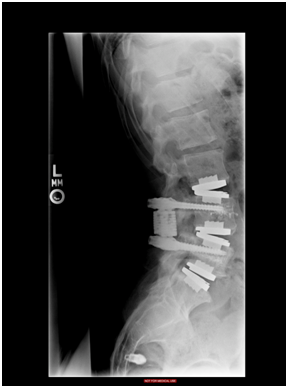 The surgical intervention most recommended for me was spinal fusion, but I feared that fusion would likely require further fusion in just a few years and would prevent me from maintaining my active lifestyle. One excellent neurosurgeon recommended instead a laminectomy as a more minimal approach, but it seemed to me that this treatment would address my symptoms rather than my underlying spinal issues (namely, degenerative disc disease and lumbar instability). I was still contemplating my options when a friend told me about Prof. Dr. Bertagnoli. Her story, in short: she had had back surgery in the United States and had been miserable with the results. She performed some research and was fortunate enough to find Prof. Dr. Bertagnoli, who fixed her back and gave her athletic life back to her. She highly recommended that I do an initial consult with Prof. Dr. Bertagnoli, and I did so at the end of 2015. The good doctor proposed a course of action to me that was very different from previous surgical proposals. He recommended installing Paradigm Spine’s Dynamic Stabilization System (“DSS”) and then, in the same surgical session, removing my three diseased discs and replacing them with Synthes’s ProDisc-L artificial discs possessing full mobility. Technically, there was a possibility that my spine would have to be fused at one of the three involved levels. The doctor would make a game-time decision after installing the DSS about whether that level needed to be fused or whether an artificial disc would do the trick, and I wouldn’t know which would happen until I awakened after surgery.) I had a lengthy email conversation with Prof. Dr. Bertagnoli’s colleague, Tim Vicknair, to gain a more complete understanding of the proposed procedure. I also spoke on the phone with three patients of Prof. Dr. Bertagnoli. All of them recommended him unreservedly. Each of them seemed to feel he was a combination of surgeon, engineer, and magician. Most of Prof. Dr. Bertagnoli’s American patients meet him for the first time the day before their surgery. It happened that I had a trip to Europe in early 2016, and I set up an appointment to meet with him and learn more about the clinic. I speak German, and I was prepared for us to converse in German, but Prof. Dr. Bertagnoli’s command of English is far better than my command of German. Thus, for the sake of maximum comprehension, we spoke in English. I was impressed with Prof. Dr. Bertagnoli and his staff, and I decided to arrange surgery with him. As I flew to Germany for my June 7 surgery date, I had mixed emotions about undergoing surgery. Various surgeons, chiropractors, and concerned friends felt that my quality of life was still good enough that I should delay surgical treatment. However, as I walked around the town of Bogen on numb legs, it became clear to me that I had made the right decision, and it was time for me to have surgery. •	June 6 I reported to the clinic in Bogen. •	June 7 I spent most of the day unconscious while Prof. Dr. Bertagnoli performed an 8-hour surgery. When I woke, I received the good news that the DSS had enhanced my lumbar stability sufficiently that there had been no need to fuse that one questionable level. 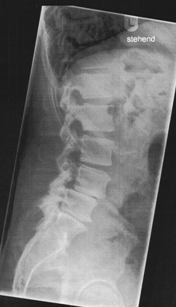 With no fusion, I could expect to have full spinal mobility at all levels after I recovered from my surgery! •	June 8 the clinic’s PT stood me up on my feet for a few seconds. I didn’t like it at all. •	June 9 I walked gingerly around the clinic. •	June 10 I walked around town a bit. •	June 13 I moved from the clinic in Bogen to a hotel room in Munich for the rest of my German convalescing. During my time based in Munich, I did plenty of walking around and low-intensity touring. •	June 22 I returned to the clinic to get checked out and hopefully receive permission to go back home to the US. Permission was granted! •	June 23 I flew home. •	Over the course of the summer, in accordance with the instructions I had been given in Germany, I slowly increased my physical therapy and my activity level and gradually stopped taking my post-surgery medicines. •	Starting in July, I started to have mild pain in my lower legs and feet. The pain was no problem during the day, but I’m a light sleeper, and so it kept me from sleeping at night. It was diagnosed as nerve pain related to my surgery, and I needed drugs to help me sleep for a while. The last drug I took in connection with my surgery was to help with this problem, and the last time I took it was October 6 (4 months after my surgery). •	At the very start of September, less than 3 months after surgery, I played in a curling tournament. Our team took 2nd place in the tournament, and I claim that our results were at least in part due to the hard work I was able to put in sweeping. •	In late December, only 6 ½ months after surgery, I went on a heli-skiing trip in Canada. I was at close to 100% of my usual skiing ability and had an amazing time. •	It has now been 2 years since my surgery, and I continue to get stronger and more flexible. It should be clear to anyone who’s read this far that I am extremely pleased with what Prof. Dr. Bertagnoli did for me. His skills and knowledge gave me back my pain-free and active life. I am able to happily ski, snowboard, curl, hike, bike, skate, paddleboard, wakesurf, lift weights, and more. To anyone who has chronic back pain and who is contemplating surgery, I recommend without hesitation getting in touch with Prof. Dr. Bertagnoli. Please see attached X-rays from the day before surgery and from a little less than 2 years later.